Jason W. Chan has been reading and writing for as long as he can remember. His favourite writers include Nicholas Sparks and Stephen King. His favorite films include Titanic, Beauty and the Beast, and A Chinese Ghost Story. As for music, he believes no one can beat Celine Dion. He lives in Canada. We are in the midst of a revolution right now in the publishing industry. As mentioned before, this industry has not seen such a dynamic change since the invention of the printing press. I do believe that just like how the mp3 changed music, the ebook will change traditional print publishing, whether people like it or not. In the past 50 years, technological advances have been pushing society forward, and as we head further into the 21st century, we should expect technology to evolve, nay, explode exponentially. I am an author of sad contemporary love stories. As for my own journey, I first started writing seriously in the Fall (Autumn) of 2008. As a newbie author then, I sent out query letters to agents, and I was dismayed by the unanimous rejections. I started writing more and more because I was certain that my craft had not been honed enough. So, I spent the next little while working and improving. Skip forward two years to 2010. By then, I had written 7 novels, and I was sure that it was time to start querying again, based on positive feedback from fellow novelists and critique circle members. The result: two agents requested partial manuscripts but both ultimately resulted in a rejection. Crushed once again, I thought about giving up. It was at that time when my good friend suggested that I upload my novels onto the Amazon Kindle. I had never heard of the Kindle until then, but it gave me hope. So, I did my research thoroughly and joined author communities to discuss literature and promote my novels. I got my first sale days later, and I was ecstatic! Someone was reading my book! That is the goal of every author and it made me believe in this industry again. It is a great time to be an author. For once, authors have control over their works. They decide on a cover, they decide on a price, they decide on the kind of promotion they want to do. This is all possible because of the age in human history we are currently in: the information age. Just 50 years ago, authors would have never been able to do all this. It is only because we are all so connected, no matter how far apart we live, that authors are able to reach out to readers and other authors on their own. 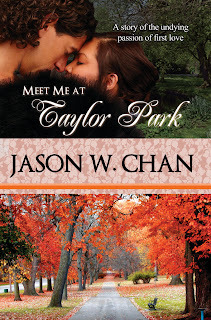 Jason W. Chan’s latest ebook novel is Meet Me at Taylor Park. The Grand Conversation on ebooks will run here at www.jiraiya.com.auuntil February 28. If you’d like to contribute a guest blog post, email me at shane@jiraiya.com.au. I am very optimistic about the future, too, Jason. Like you, I’d written a number of novels and was on the verge of giving up.